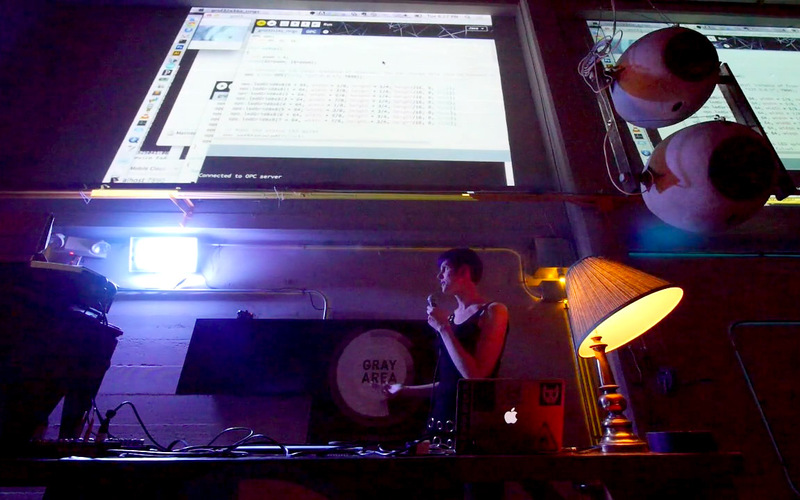 I gave a talk at the GAFFTA Creative Code Meetup back in November. It was a brief overview of my recent work including Zen Photon Garden, High Quality Zen, the Ardent Mobile Cloud Platform, and Fadecandy. It includes a live demo of Fadecandy, starting at 18:43. Creative Code Meetup VII- Micah Elizabeth Scott from GAFFTA on Vimeo. This entry was posted in LED Lighting, Portfolio, Zen photon garden and tagged fadecandy, gaffta, hqz, presentation, video on February 10, 2014 by Micah. USENIX Workshop on I/O Virtualization. WIOV was an interesting workshop. It was really nice to see what I/O virtualization looks like from a wide range of different viewpoints. There was some good industry perspective from AMD, Intel, Microsoft, and Oracle. There were also a wide range of academic interests represented. Everyone brings not only their own terminology, but their own idea of which problems are particularly hard or useful to solve. I did feel like a bit of an outsider, though. Nearly the entire workshop was focused on virtualizing storage and networking devices, which are quite a bit different from the devices I work with on a daily basis: mouse, keyboard, graphics, sound, and USB. Part of this divide is along server vs. desktop lines, but I also feel like it’s in large part due to the wide difference in status of current virtualization approaches for desktop vs. server devices. Most of the current work on networking and storage devices is in improving manageability, or squeezing out that extra 10-20% of performance overhead. This is all already assuming that there are plenty of known virtualization approaches for those devices which are both correct and reasonably performant. By contrast, current desktop device virtualization is largely neither correct nor performant. Even simple devices like mouse and keyboard must be fudged with heuristic after heuristic to bridge the impedance mismatch between a low-level mouse/keyboard and the high-level input stack abstraction you see at the windowing system or VNC layer. Sound devices are easy to emulate, but to build a truly correct sound device, you would need guarantees that can only be provided by a hard real-time operating system. USB seems on first glance like it could be simple, but there are huge impedance mismatches to be overcome, and even greater challenges in writing a CPU-efficient emulated USB controller. I feel that graphics virtualization is the biggest unsolved problem in desktop device virtualization, which is why I enjoy my day job as much as I do. But it also means that graphics virtualization is really at a totally different stage than storage or networking virtualization. Nobody has an implementation that is complete or correct, let alone performant. My team at VMware is pushing the envelope, and the technology is already usable for many people- but there’s a huge amount of work left to be done. I am very greatful to have had the opportunity to present a paper on graphics virtualization at WIOV ’08. 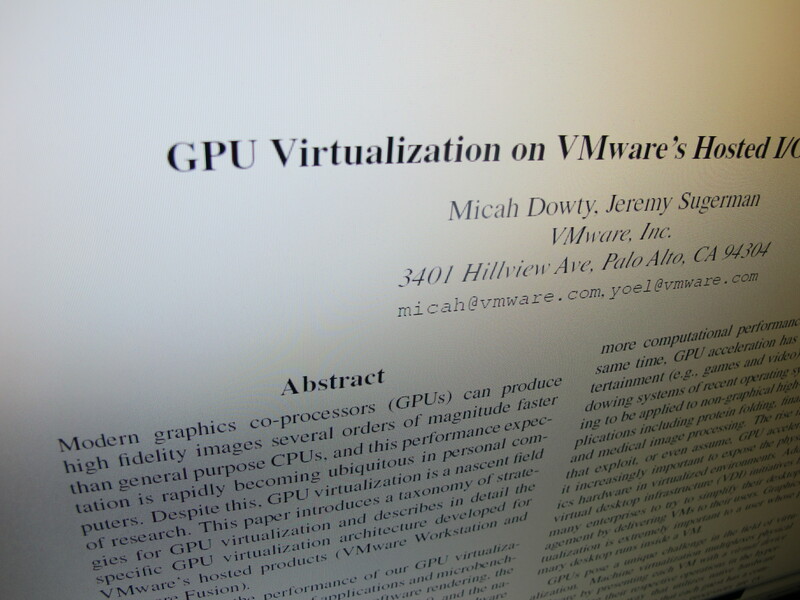 Jeremy Sugerman and I co-authored a paper which describes a taxonomy of graphics virtualization approaches, and provides implementation details and analysis for the approach VMware is currently shipping as the DirectX 9.0 virtualization in VMware Fusion and VMware Workstation. This is currently the most detailed publicly available description of the work my team has been doing over the past 4 years. If you’re interested, I encourage you to read the paper closely. It’s really packed with as much information as we could squeeze into 8 pages. The presentation followed the structure of the paper, but it was weighted heavily toward describing the motivation for GPU virtualization, the reasons why it’s hard, and the characteristics of the different approaches we outline in our taxonomy. The slides are also on SlideShare, embedded below. This entry was posted in Portfolio, Work and tagged graphics, presentation, publication, usenix, virtualization on December 12, 2008 by Micah.